Given that this was a Christmas present from Himself, I’m amazed it’s taken me this long to write about my beloved Tom Ford lipstick. The recent news that this very talented designer has brought out another covetable beauty collection, this time of bath and shower products, has prompted me to write about my last beauty obsession, this ridiculously priced ivory and gold encased tube of fabulousness. The Private Blend Lip Color collection comprises 12 classic shades which claim to be universally flattering and of these, the man himself is said to favour my own preferred shade, Cherry Lush. 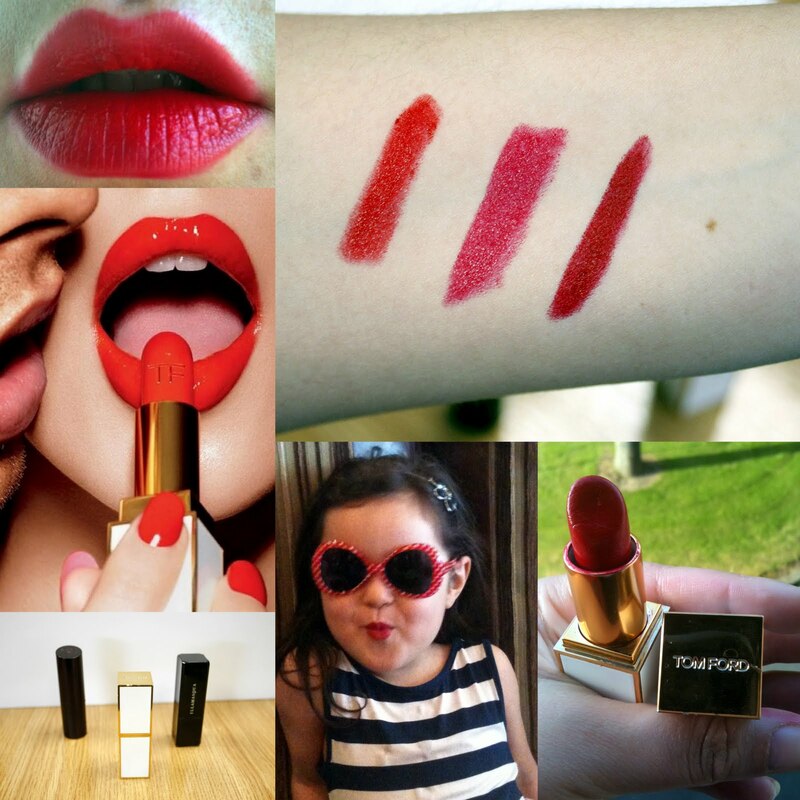 This is a gorgeous, highly pigmented and ultra creamy red with definite pink undertones. I apply it like I do all lipsticks, straight from the bullet and without a lipliner (although I’m on the lookout for a pencil to match – there’s something about the elegance of this product that makes me want to achieve a more polished look). It smells lovely, lasts well, doesn’t bleed and fades to a nice, even matte finish – brilliant if, like me, you neglect to reapply throughout the day. It’s not drying or greasy and the finish is satin, delivering perfectly on its promise of ‘pure colour with just the right amount of luminosity’. The downsides? Well, as with all red lipsticks it makes my teeth look more yellow. But that’s just the price you pay. That, and in the region of €45, which is steep no matter which way you look at it. If you ask me is it worth the hefty price-tag I’ll admit I’m not convinced - but I’m already planning my next purchase from this beautiful collection. Clockwise, from left: Cherry Lush on my lips; swatched (centre) with Rimmel's orange-based shade Alarm to the left and Ilamasqua's blue-toned red, Box, on the right; Cherry Lush taken in natural light; modelled by my gorgeous god-daughter; flanked by Rimmel's Alarm to the left and Ilamasqua's Box to the right; PR shot for the collection. Your goddaughter is too cute! Isn't she just? Adorable. Although she clearly brings out my inner Katie Price. Let's not wonder about the ethics of applying lipstick to a 3 year old. Er, this isn't her mother, by any chance, is it 'Anonymous'?! Wow - I could take a bite out of that, it looks so good ! I think cherry/red lipstick is amazing on brunettes. Nice christmas gift ! Top marks himself ! It sounds lovely! I usually do glosses for myself (looks better on my small lips) but I think I could love this product, too. I often hate how lipstick smells. And, you have gorgeous lips. Aww, your goddaughter is adorable. I love that Lipstick, soo expensive but I want it so much.